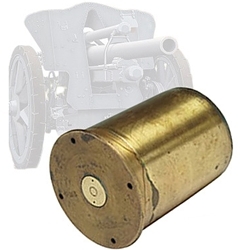 Our German Light Field Howitzer Shell Original is a used German artillery shell casing from WWII with German markings. Your choice of either a steel or brass shell casing. This type of cannon was used by the German military through world war two. These LFH18 shell casings are from the howitzers used in the mini-series "Band of Brothers" that were destroyed by Easy Company in Episode 2, Day of Days. LIMITED SUPPLIES!